Confined in a fixed position for hours on end, stressed out by traffic and with the constant vibration, it’s not surprising so many people get backache after a long drive. Work, leisure and driving all contribute to wear and tear of your back over the years. Two out of three adults will experience back pain at some time in their lives. Research from the British Chiropractic Association shows that back pain in the UK is on the increase; 52% of the country is currently suffering, compared with 47% back in 2007. Car seats usually feel comfortable when you first sit in them, but after a lengthy period of travelling, significant discomfort and even back pain may be experienced. Many car seats do not provide adequate support and can cause strain to be placed upon the bones, discs and ligaments of the back. Any lack of support is even more serious if you have a previous back injury or are suffering from muscular strain. Good, supportive seating can help to reduce discomfort and may also prevent postural backache in the first place. Providing adequate support to the back whilst travelling is important for passengers as well as drivers. Most of the following points are equally useful for passengers. 1. Tuck the buttocks right back into the corner of the seat squab and back rest, taking full advantage of the seat contours. 2. Adjust the angle of the backrest so that you can easily reach the steering wheel with the arms bent. 3. 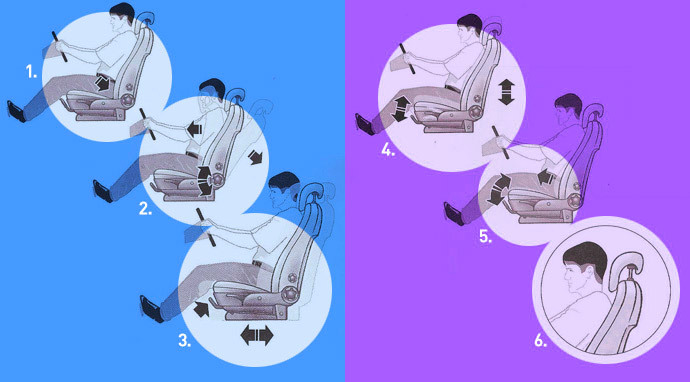 Slide the seat forward until the pedals are comfortably reached with the knees slightly bent. 4. Adjust the seat height to the highest comfortable position. 5. Adjust the seat squab so that the thighs are in contact with the seat almost up to the back of the knees. The lumbar support can be adjusted to fit the natural curve of the spine without too much pressure. 6. The centre of the head rest should be raised so that it is level with the back of the head. During driving the head should be close too, but not touching, the head restraint. What should you do whilst driving? Take a deep breath in, pull in your stomach muscles as you breathe out, relax and repeat. Raise your shoulders towards your ears and then relax them down. Push your shoulders backwards against the seat and then relax them forward. Why should you take regular breaks from driving? It’s not just your legs that need a break from driving! The discs rely upon regular movement of the spine for the supply of nutrients. To minimise the risk of lower back pain, avoid sitting still for lengthy periods and take regular exercise breaks. When you stop at motorway services, park as far from the entrance as possible so you get the chance of a short walk. Take frequent breaks, especially on a long journey. A few minutes every two hours can help prevent back pain later – it’ll also help the grey matter! If you can’t get out of the car, try altering the car seat position slightly every half an hour. Is there a way of getting in and out of the car? Try to avoid twisting when getting out of the car – turn your whole body towards the door, lower your feet to the ground, then stand up. Try to avoid any twisting when getting in to the car – sit on the edge of the seat first, then rotate your whole body into position. If there is restricted space in your vehicle, it may be helpful to slide the seat backwards to give you more room getting in and out. When driving a high vehicle, always use the footstep to climb down. It may seem quicker to jump down, but the repeated impact may be damaging to the spine. 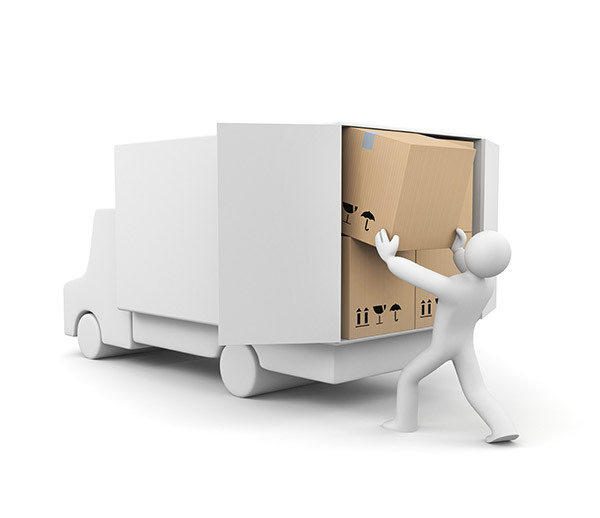 What should you do loading or unloading? If you have just spent hours on the road and your back muscles are stiff, one of the worst things you can do is lift something heavy! Even small items in and out of a car boot can be bad for your back. The golden rule when lifting is to bend your knees, not your back. If you can’t bend your knees because of the boot, then unlock your knees (loosely bent, not fully extended) to reduce the loading to your spine. Turn using your whole body; don’t twist. Carry heavy objects close to your body and don’t try to carry everything in one go! If you need something from the back seat, don’t twist and reach for it – it’s better to walk around and lift it out. Van and lorry drivers can minimise the need for lifting by using any tail lift or mechanical handling equipment provided. Special care must be taken after a long period of driving when opening rear doors, lifting roller shutters and releasing levers. Back pain is rarely serious but you should consult your Chiropractor if your back pain is not resolving or getting worse. Prepared with the help of: RECARO UK Ltd, BackCare and the British Chiropractic Association.